Fact: The company newsletter has one of the highest returns of any marketing tactic. So why is it so under utilized? Why do most companies get it so wrong? For a large number of businesses it's just a box ticking exercise. So they get poor results and wonder if it is worth the effort. But, with some minor tweaks email can become your strongest marketing tactic. This guide covers everything you need to create a high performing newsletter. Email is personal and direct to your audiences inbox. Over 3.4 billion people use email every month. Compared to 2.7 billion that use the less direct channel of social media. All in all this makes email newsletters an efficient and inexpensive marketing channel. Stats are great. But what does that mean for your business? What Makes A Good Company Newsletter? To create a “good” company newsletter you need to be clear on what good means. There are two sides to this coin. Whats "good" for you and your business, and crucially, whats "good" for your audience? In the end, to achieve your goal, you need to match readers needs with business objectives. Why do you want to create a company newsletter? How does your newsletter compliment or support other makreting efforts? Then combine this knowledge with your understanding of what's important to your customers. The best way to understand this is to have an actual conversation with them. Crazy right?! I am always amazed at how valuable a 15 minute conversation with a customer can be. And even more amazed at how many marketers skip this step. Yes its time consuming. Yes its awkward. But no survey or analytics can replace the deep insight you get from a human conversation. Who are they, what do you need to know about them to help you make decisions? What are their needs, goals and motivations? What are they reading, viewing and listening too, why? What makes content good or bad for them? What problems do they have as part of their daily role? Why are these a challenge and why are they important to them? Where is the overlap with what you are offering as a business and what they need as readers? Once you have spoken with &pm;10 readers you should see some clear patterns and trends. Use this insight to create personas that represent about 3 key customer archetypes. Personas help you to make decisions from the customers point of view. Like what content should we create or include, and what's important to the reader. Increasing your chance of creating a newsletter that readers actually value. A persona is an archetype of a group of readers. It is not a real customer, but a summary of the key attributes of a common customer. Each persona should be clearly different from the next. Seperated by key wants, needs or behaviours. You should humanise your personas by giving them a face and a name. No one is 25-45. Make them a real person, without being a real person. You should have 3-5 personas. Segment your list by persona so that every email a reader receives is hyper targeted. Here are some excellent examples from Mailchimp. They are simple, emotive and help you to understand what might be important to each. Mailchimp have seen that key needs and goals are specific to the job role that each persona has. Think about what personas and segments make sense for your business. Keep it simple. We know that having a newsletter is a good thing. How do we align it to support and amplify other marketing efforts? Where do we find content our readers will love without wasting hours every week? We've covered the importance of tying your company newsletter to your business objectives. But what about how the newsletter fits with your other marketing channels? How do you plan what needs to go into each issue, and how you can use your newsletter to support other marketing? This is where creating a newsletter schedule really helps. Creating a schedule or content calendar will enable you to see when other marketing is coming up. Then from here it's easy to set a goal for each newsletter, one that aligns with the over all business objective. When you know the goal of each newsletter, planning the content that goes into it becomes simple. I personally use Trello to plan my newsletter schedule. It makes it easy to plot each newsletter against a calendar. As well as easily add key information into the "card" for each issue. Which really helps with the planning and creation process. Once we know what the goal is, and where it fits in the overall marketing strategy, its time to find the right content. Quite frankly, your newsletter is only as good as the content it contains. Constantly creating your own content is very time consuming. It's also proven that customers actually prefer to have a mix of branded and none branded content. Which is why adding curated content to your newsletter is a win win for all. So how do we find the right content? Without spending hours every week? Enter content curation. Think of it as a large funnel. This is the most important step in the funnel, good content in, good content out. Thankfully there are lots of great sources out there to help you get this right. Think company blog, press releases, videos, slideshares etc etc. Any content that your company is creating that could be used as marketing material. Make a list of all the places your company creates and publishes so you're ready for when you need it. The people you work with are a great source of valuable and relevant content. They are reading and sharing great content every day. All you need to do is capture it. Start by seting up a content channel on a team messenger app like Slack. Then encourage people to add any interesting content they find for everyone to see. When you talk to customers a great question to ask them is what content sources do they read regularly? Also do they create and share content? Customers feel valued if you include some of their content in your newsletter. Search is an obvious choice for finding good content sources on any subject. Try searching terms like “Top <target industry> blogs” or “Top <target industry> influencers”. They will pull up some great sources to start you off. Buzzsumo is a fantastic tool. It can help you to find the most popular content and key influencers by keyword. It will also show you how popular each piece of contet is with how many times it's been shared and where. A great place to start when looking for influential content and sources. This is one of the most underutalised features of Twitter. The powerful advanced search will help you find influencers on any keyword. As well as trending content on that subject. Twitter feeds can become very noisy once you are following a decent number of accounts. Twitter lists allow you to group sources into one focused stream. They are also a great way to filter content by things like team members, customers, topics etc. We'll cover some best practices for the next steps shortley. But for advanced tips on using Twitter Lists check out this post. Medium is a great blogging platform and community. Lots of individuals use it for their own personal blog, and the quality of content is very high. It's a great source for original, opinion based content. If you use the search and tags features you can find trending and popular posts from the community. Sometimes you find great content whilst you are just browsing the web. Or reading things on your mobile. Pocket helps you to save that content. When you find it, regardless if on your mobile, or browsing the web, just pocket it. All the content you save can be easily found later with tags and a search feature. Best of all, Pocket connects with a ton of tools so it's easy to get everything in one place. Feedly is an RSS reader that helps you to pull all your content sources into one place. Any website that has an RSS feed (which is most) can be added to Feedly, or any other RSS reader. Another great choice is Feedreader. It has more functionality on the free plan then Feedly. Your content and newsletter creator all in one place. The other benefit is that Publicate connects to RSS, Pocket, Feedly and a load of other sources. Making it even easier to get all of your content into one place for when you need it. Making creating your newsletter just a case of drag and drop. Once we have our content sources sorted, we need to set them up so that they all filter into one single place. This is the most important step in the funnel, good content in, good content out. Thankfully there are lots of great sources out there to help you get this right. Saving and organising this content as you produce it will save you a lot of time down the line. Especially when you have your content schedule set up, as you will know what you need and when. How does RSS work? RSS enables websites and applications to read content that another site has published. In simple terms, you can send content produced on one website, to another website or app. Which is how you get everyhing in one place. There are several great RSS readers out there, but my choice would either be Feedly or Feedreader. As we’ll see shortly they are invaluable when it really comes to organising content. Adding blogs or websites to your RSS reader is pretty straight forward. The RSS feed of most website's can be found by adding a “/feed” to the end of the website's URL like so - www.website.com/feed. Most RSS readers will also let you search for the website within the platform and add the feed directly. It isn’t possible to get an RSS feed of fresh Tweets from Twitter directly. Which is a real shame as sending content from searches, lists and profiles in real time is huge. So, because it is so useful we have created a free Twitter RSS Feed generator. It will convert to convert any Twitter list, search, hashtag or profile into an RSS feed. This is BIG. You can get fresh content in real time straight from Twitter directly to your RSS reader. Set up the Twitter lists and searches properly and watch the high qulaity content roll in! Medium supports RSS feeds, for profiles, publications and custom domains. You can find out more about it here. So basically any sources you find on Medium can also be converted into RSS and sent to another app or website. Starting to see the power of RSS? One place for all this great content. Once everything has been converted to RSS you can send it all to one place. Top Tip: Using a newsletter builder like Publicate will bypass a lot of this step. You can connect Slack, Feedly, Pocket and Twitter to your library without having to convert to RSS. Putting the content you need, where you need it. Try Publicate for free Now. Having everything in one place will save you a ton of time, and save you from jumping between tons of platforms. But... Adding all your content sources to one place can become overwhelming if it's not managed. Fear not, here are some killer tips to filter out only the best content and to keep on top of everything. The biggest pitfall is not setting up a routine to check and filter content often. It has to be something that is easy to do. Schedule 30 minutes at the start of each day to visit your RSS reader and scan the headlines. I read through the headlines on the Feedly app on my morning commute. To make a habit stick, pick a an action to go with it. Like "when I sit down on the train I will open Feedly". Or " When I sit at my desk I will check Feedreader". Doing something is better then nothing. You are also not going to get to inbox zero. Who cares anyway. The point of this is to find good content. If you are not finding good content review your sources. Then stick to your fixed routine of time. I personally set a timer. The content you get through in that time is the content you were meant to get through. Also scanning titles and having a system helps with this. In your time box just get through titles. Tag, save or organise the content as you go. This way you are applying a first round of filter to focus deeper effort on only relevant stuff. Being clear on what stacks up as quality content is key once you get to the reading stage. It will help you to scan content quickly to determine if it makes the grade or not. Learning to speed read is pretty helpful too. More on that here. This step is crucial. You need to set up a system that will seperate out the best content for when you need it. There are tons of rules and integrations you can set up to get content from your RSS reader to somewhere else. You could use IFTTT or Zapier for example. They will help you create a rule that sends any content you tag or add to a board to a specific destination. Like a Google Sheet, Slack or Pocket for instance. All you need to do is tag the best content with X, and it appears in your chosen destination ready for you to action. All this curation and filtering is to get the best content for your newsletter right? With Publicate you can connect all the content sources straight to your library. Making the content you need for your newsletter available for you to add to your emails. This makes building your newsletter just a case of drag and drop. Top Tip: Try the Publicate newsletter creator here. Unlock hours of wasted time every week. What are the best company newsletter ideas? Knowing what to add to your newsletter can be a real challenge. It gets to d-day and we scramble about for anything of interest. The newsletter becomes stagnant and boring. With no clear purpose or value. Looking for ideas that will keep your readers locked in and wanting more? This post is for you. Packed with 19 of the most inspiration company newsletter ideas. Sure to keep your readers locked in and wanting more. This first company newsletter idea is a no brainer. Got some big news about your business? It's probably something that prospective customers are interested in. Particularly if it gives them more trust in their relationship with you. Pull together press releases and quotes from the business owner. Try and include customer video interviews or testimonials to back up the announcement. These are perfect for up-selling products and services to customers. Especially those that might not even know about them. Customers are often only aware of the services or products that you currently work with them on. Showcase how you are working with other customers. Educate and inspire them to what is possible, and why they would want to. Pull together information about the product and services. Include video interviews and other testimonials with the customer. Don't forget to highlight any key results achieved. This could be as simple as Instagram pictures of the latest team building exercise. Or it could be a thought provoking piece that one of your employees has written. Showing your business understands the customers goals and needs. This is one of the lesser used company newsletter ideas, but shouldn’t be. Staff content is a powerful tool for building your business's culture and personality. It also helps to make staff feel valued and included. Whats not to like. What questions do existing customers frequently ask? Start making a record or find out from customer services or sales. Then answer the most popular questions in your newsletter. It's also a great chance to link to testimonials, case studies and other relevant content. Helping them further with an answer and some social proof. People love to be inspired and to discover new and interesting things. The key is to find inspirational content that makes sense to your business or the newsletter. A good rule of thumb is to ask yourself, “why is it important that I include this content in this company newsletter?” If you don’t really know, leave it out. Drum up excitement and attendance for an upcoming event. Round up speaker profiles and relevant content that builds on the agenda. It's also an opportunity to add some of your own relevant content into the mix. You could even summarise an event for customers who couldn't attend. Include links to presentations, summarise the social buzz and include any other resources. Just like you, your customers and clients need to know what's going on in the industry. Why not make their lives easier by rounding up the key information and news that you’ve found over the week? Add your own opinion and insight to highlight why the content would be interesting to them. Every industry evolves and changes. We all spend a decent amount of time keeping up to date on the latest trends, resources and best practices. Help your customers stay ahead of the curve with a roundup on the latest trends and best practices. You know your stuff, you need your customers to know and trust that you know your stuff. Providing comment and opinion on major statistics, analysis and insight is a great way to do that. Stats are also incredibly shareable content. Statistic roundups are always very popular with readers from any industry. Books, blogs, publications, podcasts, articles, reports, other newsletters, videos, slide decks etc. Your newsletter is a great medium to curate the best bits from various sources into one. Saving customer from having to visit them all, as you already have. Focus on the questions and needs your know your customers have when choosing content. People trust your brand more if you’re not the only one talking about the benefits you offer. Create interviews with trusted people from the industry. Discuss common customer problems and the benefits of solving them. Obviously with a solution like yours. You’ll get the message across without having to say it yourself. The interviews can also be repurposed into a variety of content formats to extend your reach. This is a company newsletter idea no brainer. As much as we would love our customers to be reading every blog post we create, it just doesn't happen. In fact most of our customers don’t visit our blog or social channels frequently. Hence why the company newsletter is such a valuable part of content distribution. Remind customers of the best content by delivering it straight to their inbox. Company newsletters are a great way of announcing promotions or deals that you might have on. As we know from the stats, email marketing has higher conversions than any other channel. So there really is no better medium. Clients become very focused on the features or services that they already use with you. Think about your relationship with Facebook. What do all the 100’s of other features in the left column do? I don’t know either! If you want customers to know about new features and services you have to tell them about them. The company newsletter is fantastic for this, especially with GIFs and videos. Social proof is big. Your voice is not as powerful as a customers voice, particularly in a positive review. Collect reviews and testimonials and include them in your newsletter. Great for when you are announcing some new functionality or a new product. If you can include a face and a name it really helps readers to empathise and relate. Making them more powerful. This is one of the fun things to put in a newsletter. People like to participate, especially if there is something in it for them. Surveys are probably the least exciting of the the three. That doesn't mean you can't offer exciting incentives to tempt people to take action. Perhaps a years supply to a coffee subscription? If the competition or quiz is designed with incentives to share it with others, you could add to your reach. Any of these can easily be added to your newsletter and promoted to all of your readers. This is a really important idea for your company newsletter. You’ve got a blog, you’re sharing on social media, what's the benefit of signing up to your newsletter as well? Make sure readers know why they would want to receive your newsletter. What offer can you reward customers with for signing up? Could it be getting content before anyone else? What about exclusive offers, or even reports that other customers just wouldn't get? It will make your readers feel rewarded and encourage new subscribers. Bring personality to your newsletter by celebrating team members and employees. People make a business, customers are people. People want to relationships with people. Putting a spotlight on the human side of the company will make your business more personable. It's also a great way to reward team members. Publicly celebrating their efforts and achievements. Which also then shows how well your business is doing at the same time. Including content that your community or customers have created is powerful. It makes people feel valued and part of something. Including posts from social media, or any content they have created is a great way to foster a community. It will also help them with their own reach and they will thank you for it and even return the favour. Sending customers a company newsletter isn’t a right, it’s a privilege. It should be something that they want to receive and actually value. As we covered earlier, it’s about understanding your customers, which shouldn’t just be a one time thing. Regularly asking for feedback will ensure your newsletter is actually valuable. It will also make readers feel like you care about their point of view, but only if it is acted on! This feedback also then helps with segmenting your mailing list. Which can help to improve relevance. Which we are going to cover in the next part of this guide. The company newsletter template is as important as your content. Think of it as the house and your content is the furniture and appliances. Companies can spend $1,000's on design and development to get it right. Content that gets added doesn't align. Images need resizing and cropping. Frustration builds. Luckily there is a simpler way. This chapter breaks the newsletter down into it's key components. It covers best newsletter design practices and suggests tools you can use yourself. Without design or development to get your email newsletter design right. There is no one size fits all for email templates. There are however some key best practices that will help you to get the right results. Lets dive into them now. As we'll see in the rest of the best practices, this applies to most aspects of email newsletter design. It's also why it is so important to understand the goal of your newsletter. Helping you to keep the content and call to actions focused. If the content or design doesn't aid you in reaching the goal of the newsletter then leave it out. Colours are a great way of defining sections and making call to actions stand out. The key is not to use too many different colours. Aim for one main contrasting colour, not several. For example, if your company colours are blue and grey, don't use orange and red as contrasting colours. Pick one of them. The colours you use in your template should align with your brand colours. This helps to keep consistency and familiarity with customers. It also helps to select a colour pallet that is consistent across newsletter issues. Consistent colours help to create learnability. Customers will know that orange is a call to action, blue is a title etc. It's all part of not making people think. This post from Canva on colour and newsletter design inspiration is a good place to start. 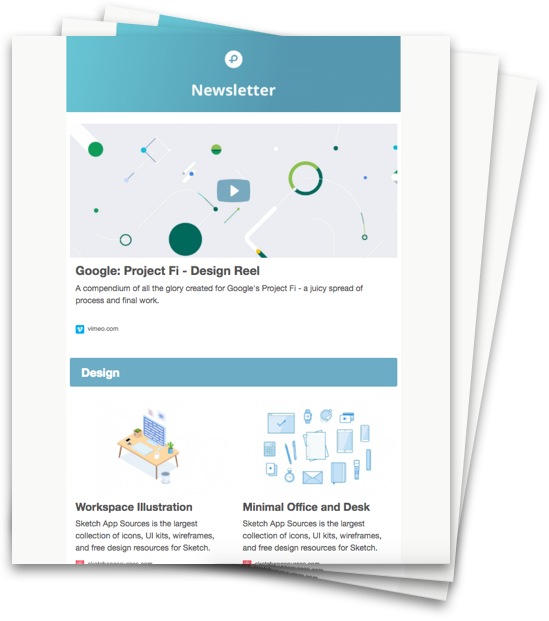 Any newsletter can be broken down into several key areas for design. To take colour consistency to the next level, you can apply a colour filter to any images you add. Most design software will let you do this. I would recommend Canva though, as it is a simple to use free tool. There are endless layout possibilities with any newsletter. The layout, spacing and sections you include are key to getting the right structure. They should all support and emphasise the content within the newsletter and it's goal. Using these elements creates focus and increases readability of your emails. Which in turn improves click throughs and helps you to reach your goals. There are 8 major content layout combinations for any section of your email template. But combined over many sections, it creates endless variations and combinations. Choosing the right combination depends on the newsletters goal and the required content. Knowing this helps you to determine the flow of the email, where to position content and its priority. Start with the goal of the newsletter. Then review the content you are going to include to reach that goal. Finally what is the best way to lay it out so that it is visually appealing and easy to read. I sometimes sketch out on a piece of paper where all the content will go before creating the layout. Sections help to differentiate various areas of information within your company newsletter. They break it up from being one solid block of content. This is particularly important if you have many topics or categories to cover. Using colour can be a powerful way of defining the sections. Particularly on elements like backgrounds, titles, dividers and images. The right amount of spacing stops your newsletter from feeling cluttered and overwhelming. In the case of spacing, more actually is more. Adding space between sections and content will help it to breath. Making it easier to read. We all know that feeling when we open an email and see a busy wall of information. Your brain shuts down, we don't know where to start and we close it. Use appropriate spacing to lead the reader through the newsletter. Break up sections and content so they don't merge in a blur of information. Too much space however, can make the relationships between sections and content unclear. So as you're adding space, make sure it isn't confusing relationships between the content. Generally, unless we are designers we are too shy to add enough spacing. We have a tendency to try and cram too much in. Think Apple design, clean, spacious, never overwhelming. If you're finding yourself cramming too much in, review if all the content is necessary. Always go for the quality over quantity approach. Make your call to actions clear and relevant. You should also try to focus on one main call to action per newsletter. What is the one key thing you want the reader to do from reading this email? Focus on that and then ensure that the surrounding content and layout supports this. Studies show that adding too many call to actions can result in no action at all. Sections are a great way to separate out multiple call to actions if you need to include several. The trick is to ensure that the call to action is clearly related to the right content. There are many ways to add branding to your business newsletter. As we've already covered, the use of colour can be an instant way to achieve brand recognition. The other most common is to add your logo to the header and/or footer of the newsletter. It's important that you communicate your brand so that it becomes familiar with readers. But use a subtle approach. Appropriate colours and subtle placement of logos should be enough. Let the content do the talking rather than make it an advert for your business. Think about creating a branded header that adds to the newsletter. It could include the name of the newsletter, an emotive image and then see how and if your logo works. Again Canva is great platform for newsletter header design. You'll also find a load of email header design ideas, as there are several templates to choose from. Social media makes for engaging newsletter content and fostering a community. But it is also a great place to actually link to your social profiles. Helping people to connect to you on the platforms they already engage in. The default placement is social share at the beginning and links to your social profiles at the end. There is a lot of debate about the use of images in newsletters. Are they engaging or distracting? Do they result in higher click throughs or less? What is there impact on analytics? There are arguments for both sides. I believe it comes down to the purpose of the newsletter and the content you are including in it. It is a fact that images are more engaging than just text alone and can increase click throughs. But too many images can be distracting, resulting in too much choice. Which can lead to indecision or a blur on what the real focus is. When finding and including images, ask yourself, does the image enhance the content? Or does it confuse and busy the content. Lets say the purpose of the newsletter is to drive one specific action. Then there shouldn't be lots of other image rich content that doesn't support this main message. Yet if it is a roundup of valuable articles, then images would be appropriate. Helping to boost engagement compared to a wall of text and links. You can find 23 mind blowing sites to find and use royalty free newsletter images here. The popularity of GIFs in marketing has exploded in the last few years. As with images there's a lot of talk about the benefits of using GIFs in email newsletters. Also as with images, if used appropriately they can increase click through rates. You can find more stats and proof in this email gif guide. Their main value lies in how well they capture attention. As well as the amount of information they can communicate vs text or static images. The golden rule is relevance. Like all content, it should be used to support and amplify content, not distract or detract. If you're looking to create your own animated GIFs for your email campaigns, this ones from you. It covers all of the best GIF makers for 2018. Video is becoming more and more popular. Not just in content marketing, but also in newsletters. The reason is clear. It is down to how engaging and informative video is as a content format. Again it's something that should be used appropriately, and does have some downsides. Downsides like the fact that it is very expensive to create. People also have short attention spans, so you need to grab them in the first few seconds for it to work. Most importantly, few email service providers actually support video in email (yet). In fact only 4 of the major email clients will support video play in email. Which is another reason why GIF is so popular, as it is supported by pretty much all clients. Whilst not all email clients support video, you can still create the impression of adding a video. To do this add the play icon over an image. Then just hyperlink the image to the original video. Simple is often the best with company newsletter footers. Their purpose is more about formalities then enhancing content. So to avoid distraction only include things that are really needed. There is nothing worse then a huge block of text explaining your legal rights. Unsubscribe, delete. Speaking of unsubscribe, make it obvious and friendly. You don't want people subscribed if they are not interested in what you are sending out. It will result in poor analytics and possibly being marked as spam. The footer is definitely the best place for the unsubscribe. It can also be a good place to add subtle branding and contact details. Quite simply, it needs to be. Over 50% of email is read on a mobile device. Make sure the platform that you are using to create your newsletter is mobile responsive. Or if you are asking design and engineering to code your template, then it needs to be well tested. Email on Acid is a good way to test your newsletters performance across many clients. If you want to create a responsive email yourself, you may want to consider Publicate. Everything you create is automatically mobile responsive. And the HTML will work in all email service providers, including Outlook and Gmail. No need for design and development work, just drag and drop. There is a great review of 25 of the best email platforms here. The main difference between them is generally niche functionality and price. Yet all have one main thing in common. For most people creating the company newsletter is a laborious task. Having to wrestle with cumbersome editors. Uploading pictures, then having to resize them and upload again. Hyperlinking everything and struggling with overall alignment. This leads to businesses asking design and development to create costly templates. Which in the end still suffer the same laborious issues for any marketer trying to use it. All in all the time taken to create a good looking newsletter puts a lot of people off actually starting one. It causes us to lose focus on the most important part, the content within. Which is exactly why we created Publicate. It's core stregnth lies in the content library. Which saves all of the interesting content you want to use in your newsletters. To add it to a new issue all you have to do is drag content from your library and drop it into your layout. It also has millions of royalty free images you can search through, right in your workspace. All images can resized and cropped right in the editor. Ensuring you to get the right alignment everytime. It also works with all major email service providers. So you still get their powerful features, but without the stressful creation experience. You can even use it to send HTML email in Outlook or send HTML email in Gmail Gmail. Let's take a look at some of the best company newsletters I've seen. Each one of these businesses has understood their customer. And then mapped that understanding back to the company objectives. WE are a charity that empowers people in impoverished countries to help themselves. WE's example is great because of it simple format. It's made up of 3 sections, keeping it clear and focused. A large emotive call to action, inspiring people to change the world and take action. This is the core objective with this newsletter, to increase donations. Putting it large and upfront helps to make it clear. Company updates. They have 2 concise content pieces. First, on the work that WE has been doing, and the second on the company and their ethics. This tackles a core barrier in some peoples minds about how charity money is spent. Both of these pieces strengthen the core call to action. Different ways to help. They have 3 clear call to action. Making it easy for people to take action and give in a way that suits them. Overall they have enabled the reader to quickly take action and find out more if needed. All whilst answering potential questions readers might have as they read. Tookapic is a photo service that helps you to create a visual diary of your life, one picture a day. For them building a community is a key aspect of growing their business. Which shows in this email. The email is conversational to start. With a friendly opening blurb that gives it a community feel right away. This is followed by a big call to action prompting readers to check out each social network. It lets people know what to expect from each social network, and why each is different and worth visiting. Community engagement. Tookapic run a weekly survey to engage the community to choose a weekly theme. Including this in the newsletter makes the community feel involved and celebrated. From the blog. Including blog content is a great way to get it in front of more readers. Not everyone visits your blog regularly. Fostering ambassadors. Encourage readers to promote you socially with Perks. A great way to encourage your community and increase your reach. Overall it's clear their objective is to nuture thier community. So they are using their email to make it easy for readers to be more involved. LiveChat offers a messenger service to chat with customers live on your website. Their customers are interested in knowing about customer service best practices. As well as how their customer service performance compares. Which is why this is a great example of using the company newsletter to support a wider marketing tactic. LiveChat have invested in an in-depth report on the State Of Customer Service. The aim of this newsletter is to promote it far and wide. The first section has a a great set up. Highlighting a key statistic about the success of customer service. Echoing the importance of reading the full report. The clear call to action makes getting your hands on the full report simple. The next section highlights further key stats from the report. Teasing you with some snippets of the benchmarks available. "Check your customer satisfaction results". This is a lcear call to action that taps into the desire to compare your performance. All whilst driving customers to the live chat product. A final section backs up the data with validation from other thought leaders in the industry. Showing that it is not just LiveChats' opinion. This company newsletter promotes a larger marketing tactic - the downloadable report. Whilst highlighting the importance of customer support. Hopefully you now have a clear understanding of why you would want a company newsletter. And, how to get it started, where to find great content and how to create the right template. Above anything keep it simple, focus on the reader and know why you want a newsletter in the first place.